This volume offers an indispensable guide for those who intend to gain a deeper insight in the world of corporations operating publicly on the stock exchanges. The authors of the book introduce the IPO’s and the operation of listed corporations on the regulated markets including the possibility of hostile takeovers. Special attention is paid on the normative basis of both ethical and legal aspects of corporate governance. The book can be used as a handbook as well; it guides professionals on the basis of practical information in three parts. 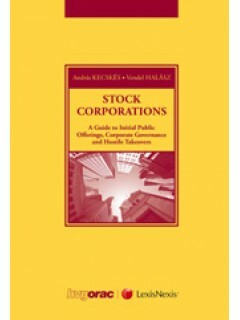 Initially, it describes the establishment of public corporations, and the mechanisms of initial public offerings. Afterwards, it introduces the rules pertaining to corporate governance. Finally it highlights the regulatory background of acquisitions. The book pays a particular attention to the regulatory innovations of the past decade, which can be regarded as a direct consequence of the various crises, which started from the capital markets. The volume includes both the highly regarded international professional viewpoints, and a wide ranging comparative legal background. This book on the one hand focuses on European and US regulatory solutions, but the Hungarian regulation on investor and creditor protection also gets a detailed introduction, which may serve as a guiding post for the investors visiting the Hungarian capital market, both from a theoretical and a practical perspective.